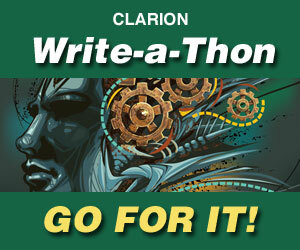 Would you like to support Clarion and help foster the speculative fiction community? Donate to the foundation. Every amount helps – and is fully tax-deductible to the extent permitted by law. You can provide a one-time donation, or a recurring monthly donation. Volunteer your time and talents. The Clarion Foundation is run entirely by volunteers, with minimal overhead. We are always looking for people who can help us with fundraising efforts, marketing, and social media. If you’d like to help us out, please get in touch. Support the works of members of the Clarion community! Each year, our alumni, students, and instructors publish amazing works of fiction, nonfiction, poetry, and beyond. To learn more about recent student works, sign up for our newsletter (we never spam, and we send emails only about once a month).